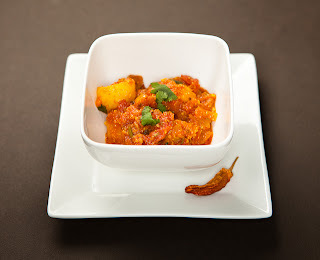 Dam aloo (also known as dum aloo) is a potato-based North Indian dish. This is another recipe from my cousin Bharti and it has an intense flavour resulting from the relatively long cooking time. Having said that you can still make it within 40 minutes and as my father-in-law would say "it's nee bother". Drain the potatoes and then shallow fry them in a little vegetable oil until crispy. Meanwhile place the peanuts, coconut, sesame seeds, poppy seeds, dried red chilli, fennel seeds, coriander seeds, clove, black pepper corns and cinnamon in a blender. Blitz until you have a paste. Place 1 tablespoon of vegetable oil in a saucepan and heat on a low heat. Add the cashew nuts and let them fry gently until they start to change colour. Add the onions and let them cook until then turn light brown. Now add the salt and tomatoes. Stir well and let the dish cook for 2-3 minutes on a medium heat. Turn the heat down to low and add the paste that you created in step 2. Stir well. Add the garlic, ginger, green chilli and turmeric. Stir well and continue to cook on a low heat for 7-8 minutes. Now add half of the coriander and let the mixture cook for a few more minutes. Add the fried potatoes to the mixture and stir well. Now add the water. Stir again and let the mixture cook on low for 5 - 10 minutes. Taste the dish and adjust the seasoning if necessary. Garnish with the remaining coriander and serve with naan or rice. Week 5: This was a great accompaniment with the Methi Chicken. Tasty as always. Loving it, Saturday nights will never be the same.